Appearance: Clear golden-amber color with medium carbonation giving a beautiful fluffy white head that leaves behind walls of lacing. Smell: Smells just like what you would expect an American craft lager to smell like; clean beer essence with sweet malts and some flowery hops. Initial Taste: The first flavor to cross the tongue is bready malts followed up very quickly with a hop bite with some grainy finish. There is a nice contrast between the spicy hops and sweet malts yet the balance seems to be pretty hop heavy. The aftertaste is bitter, crisp, clean and refreshing. Thoughts: This lager is the flagship beer for the Brooklyn Brewery. This is their interpretation of a Vienna style lager. It is complex yet smooth enough to be a session beer without question. I do have to say that there were a little more hops than what I expected to find in an American style lager. This is not a bad thing…just something out of the ordinary. The positive thing about making this beer hoppy is that the bitterness helps to clear the pallet and leave you longing for more beer! Always a good thing. 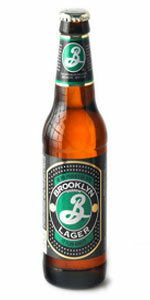 If you’re a fan of Brooklyn Brewery then you must check out this lager. Like the rest of their lineup, this lager does not disappoint.